A lot of buzz was generated recently in the Perl community after DotCloud, a big PaaS player, introduced its brand new Perl stack, letting developers deploy modern Perl web applications into the "Cloud" without having to worry about the underlying system at all. DotCloud already provides a nice Dancer example, and sri was diligent enough to provide a Mojolicious example as soon as he got his hands on an account. So when I got my own invitation to the service, I wondered how Catalyst would stand to the challenge. So, without further ado, here's the Catalyst DotCloud deploy process! $ dotcloud push catalyst.www . 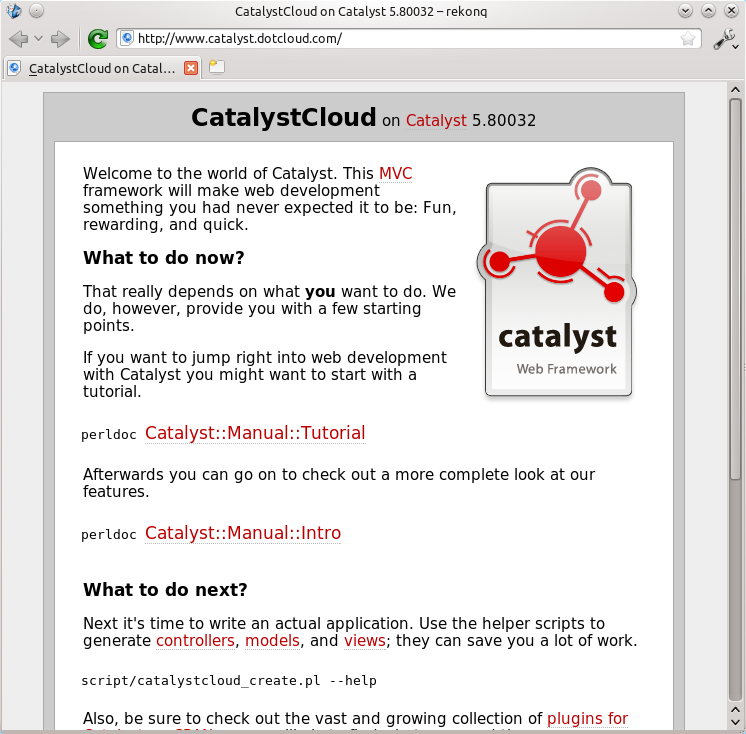 Now sit back and watch as DotCloud smoothly walks through all of Catalyst's dependencies and deploys your app to the Web. Sweet! Once you start working on your application, remember to keep your Makefile.PL up-to-date, adding any and all dependencies to it (like Catalyst::View::TT and Catalyst::Model::DBIC::Schema). But you already do that, don't you? If you run into trouble, give "dotcloud logs catalyst.www" a try (again, replacing the catalyst.www namespace with your app's) and browse through you application's logs in real time. 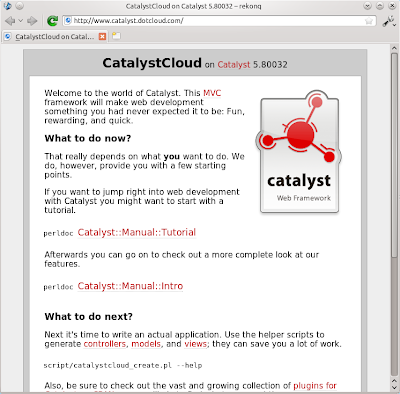 If you left the -Debug flag on, you can even see Catalyst's messages on the fly. This is my job for Saturday! Maybe time to update this article? It's obsolete information. Failed. But that was more about my app. More later.